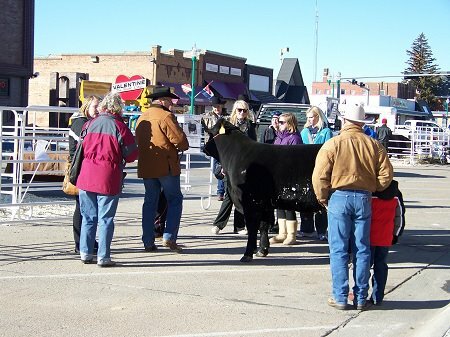 The bulls are back on Main Street this Saturday, February 9th and there are many events to keep you busy throughout the day. There are 17 bull exhibitors with 24 pens of bulls, along with 16 commercial exhibitors. Be sure to check out the Purina tent as well, as 6 of those commercial exhibitors will be located inside of it. The 5K Fun Run/Walk kicks off at 11 am with check in prior to the event at the Comfort Inn. There will be a craft show from 10 am – 5 pm at the new Connot Brothers Auction Facility on East 1st Street along with a vendor show at the Masonic Lodge with funds being raised for Job’s Daughters, and more vendors can be found at the Vet’s Club. Stop by Security First Bank from 10:30 am until 4 pm for the 4-H Luck of the Draw, with drawing to be held at the Vet’s Club. The Vet’s Club will also be hosting the Country Pride Bloody Mary bar. Sandhills State Bank is another hot spot, with Sand Painters Art Show from 10 am – 3 pm, Tall Tails Taxidermy, Bar None Hat Company, and gun raffle for a 223 Henry with profits going to the FFA. Nelsen Furniture is hosting the quilt show from 9 am – 4 pm and wine tasting will be held at Mike’s Market from 2-4, with proceeds benefiting the Sandhills Cancer Fund. Area businesses will be holding in store specials as well, and the public is encouraged to get out and check out all the activities on Bull Bash Saturday!